a truly great resource for photographs of ships, and I stumbled across a US World War II cruiser, USS Canberra. I had some immediate and brief confusion, thinking about HMAS Canberra which had served with the US Fleet in the Pacific during World War II but a quick view of a photograph of the ship eliminated that confusion. I then got to wondering how many navy vessels have borne the name “Canberra“. I’m not thinking about general marine, as I know there was a cruise liner named Canberra but rather vessels in the defence forces of various countries called Canberra. These then are the ones I have come up with. The first Canberra was a County-class cruiser launched in 1927 and sunk after the battle of Savo Island in 1942. The second Canberra was an Adelaide class guided missile frigate launched in 1978. The third Canberra will be the first of two Canberra class large amphibious ships due to enter service in 2012. HMAS Canberra (D33), named after the Australian capital city of Canberra, was a Royal Australian Navy (RAN) heavy cruiser of the Kent sub-class of County class cruisers, which served between 1928 and 1942. She was sunk in the Battle of Savo Island, on 9 August 1942, during World War II. The Canberra was replaced with HMAS Shropshire, the previous HMS Shropshire, which was transferred to the RAN on 20 April 1943. USS Canberra (CA-70, ex-CAG-2, ex-CA-70) was a Baltimore class cruiser and later a Boston class guided missile cruiser of the United States Navy. She served from 1943 until 1970, and participated in World War II and the Cuban Missile Crisis naval blockade. 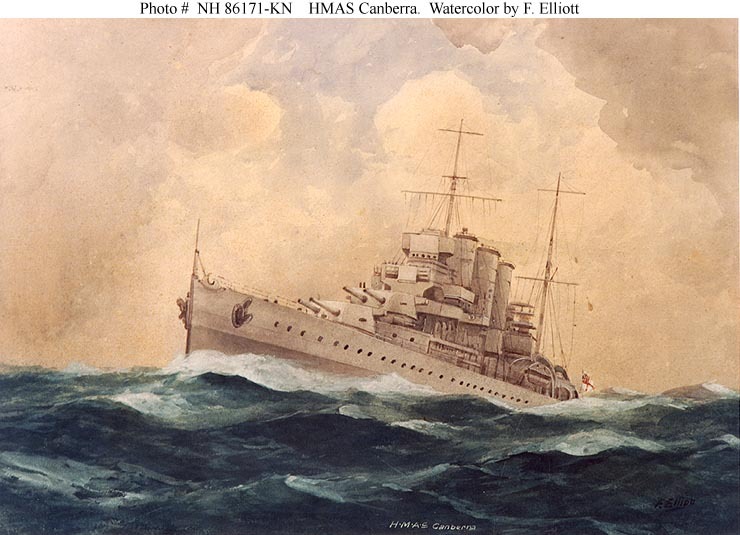 Canberra was named after the Royal Australian Navy’s County class cruiser, HMAS Canberra, which was sunk during the Battle of Savo Island. 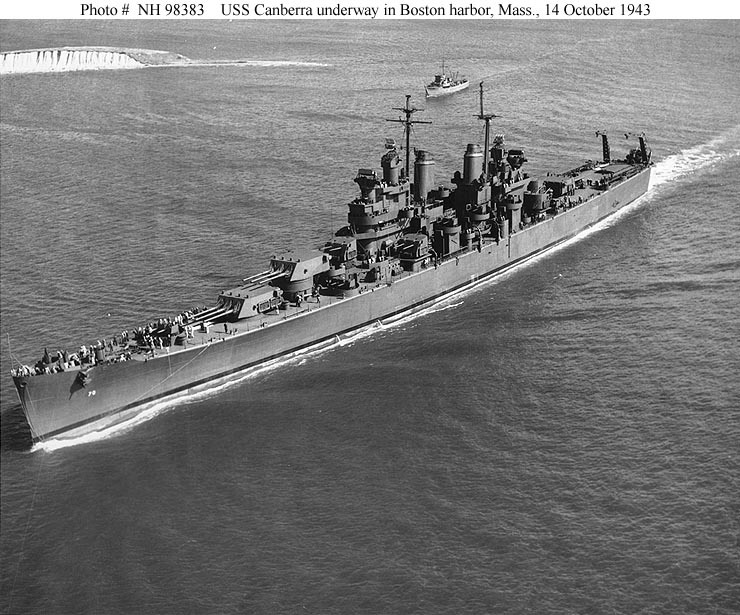 A Baltimore class cruiser under construction was selected to become USS Canberra after a request from the US President Roosevelt for a ship to commemorate the loss of HMAS Canberra. The Baltimore class cruiser previously designated as USS Pittsburgh was renamed, and was launched as USS Canberra on 19 April 1943 – interestingly, the day before the UK government transferred the Shropshire to the RAN. USS Canberra was launched by Lady Alice C. Dixon, the wife of Sir Owen Dixon, Australia’s ambassador to the United States, and is the only United States warship to be named after a foreign city. Since there was a policy not to duplicate names across the Allied fleets, plans to rename Shropshire as Canberra were negated. The Australian Government returned this tribute by naming a new Tribal class destroyer, HMAS Bataan, in honour of the Battle of Bataan – the only Tribal class destroyer that I am aware of that is not actually named after a tribe. SS Canberra was an ocean liner, which later operated on cruises, in the P&O fleet from 1961 to 1997. She was built at the Harland and Wolff shipyard in Belfast, Northern Ireland at a cost of UK £17 million, and was launched on 16 March 1960. The ship was named on 17 March 1958, after the federal capital of Australia, Canberra, and entered service in May 1961. SS Canberra served the British armed forces during the Falklands War in 1982 by acting as a troopship. She remained in her white colour and this may have saved her from damage from the Argentine Air Force as the Argentine pilots claimed they were told not to hit the Canberra, as they mistook her for a Hospital Ship. So, Canberra seems to be a gallant name for a ship – funny that the city of Canberra is so far from the sea.